Other common names: Houndsbene, marvel, marrube. 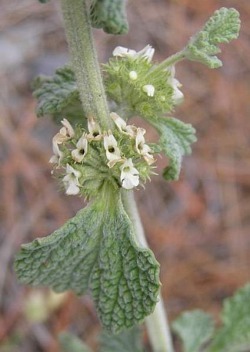 Habitat and range: Horehound grows in dry sandy or stony soil in waste places, along roadsides and near dwellings, in fields, and pastures. It is found from Maine to South Carolina, Texas, and westward to California and Oregon. It is very abundant in pastures in Oregon and California, and especially in southern California, where it is a very trouble-some weed, covering vast areas and in such dense masses as to crowd out all other vegetation. It has been naturalized from Europe. Description: The entire plant is thickly covered with hairs, which give it a whitish, woolly appearance. It is a bushy, branching herb, having a pleasant aromatic odor, and is about 1 to 3 feet high, with many woolly stems rounded below and four angled above, with opposite, oval or roundish, wrinkled, strongly veined, and very hoary leaves. The leaves are about 1 to 2 inches in length, placed opposite each other on the stem, oval or nearly round, somewhat blunt at the apex, and narrowed or somewhat heart shaped at the base, the margins round toothed; the upper surface is wrinkled and somewhat hairy, while the lower surface is very hoary and prominently veined. The lip-shaped flowers, which appear from June to September, show that it is a member of the mint family (Menthaceae). These are borne in dense woolly clusters in the axils of the leaves and are whitish, two lipped, the upper lip two lobed, the lower three lobed. The hooked calyx teeth of the mature flower heads cling to the wool of sheep, resulting in the scattering of the seeds. Collection, prices, and uses: The leaves and tops are the parts used in medicine and are official in the United States Pharmacopoeia. These are gathered just before the plant is in flower, the coarse stalks being rejected. They should be carefully dried in the shade. The odor is pleasant, rather aromatic, but diminishes in drying. The taste is bitter and persistent. Horehound at present brings about 1/2 to 2 cents a pound. It is well known as a domestic remedy for colds and is also used in dyspepsia and for expelling worms.